Isn't it a shame that so many of the actors we love never knew they would live on in our hearts? Dwight Frye would have been pleased, I think, to know we remember him well. Born in 1899, Dwight had a decade of popular success during the 20's on Broadway, mostly in comedies and light romances. Then he went to Hollywood. We know him best as Renfield to Bela Lugosi's Dracula. Dwight's bulging eyes, great shark-like grin, and that famous laugh - "Uh heh heh heh heh heh!" -- who could forget it? Dwight's Hollywood career was a great disappointment to him. His parts, mainly Renfield, Fritz the hunchback assistant in Frankenstein, Karl the equally unpleasant assistant in Bride of Frankenstein, Herman the village half-wit in The Vampire Bat, various uncredited torch-bearing villagers in other horror films - these were his main stock in trade. He did a few regular movies, but not roles in which he could shine. Much of his work ended up on cutting room floors. He always wished for legitimate acting parts, mostly hoping for comedic roles, but the typecasting curse was too strong. In 1943, Dwight joined in the war effort by working for Lockheed Aircraft Company. His health failed because of a coronary condition, for which he did not seek medical attention because of his devout Christian Science beliefs. He died in that same year of 1943, only 44 years old and leaving a wife and son. Unhappily, he was being considered for a decent role as a political figure in a film to be directed by Henry King when he died. I don't know if he ever knew about it. Sadly, his occupation was registered on the death certificated as "tool designer." But we know better. Dwight Frye will always be an important actor to lovers of the original horror movies. 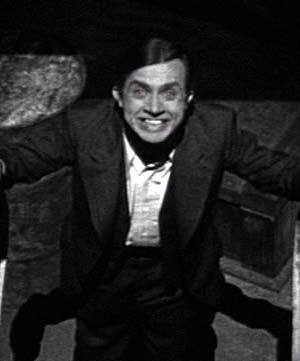 Dracula alone would never have been as entertaining without Dwight as the crazy "old fly eater", as the asylum keeper called him. So just for Dwight, let's all together: "Uh heh heh heh heh heh!" Becky, what a good choice for Underrated Performer of the Month! Dwight may not have gotten a lot of juicy roles, but he certainly made Renfield an iconic one. I think it's the ultimate compliment for an actor when one of their performances is parodied, as Peter MacNicol did with Dwight's Renfield in DRACULA: DEAD AND LOVING IT. I really enjoyed your informative profile (and nice photos). Becky, an excellent write-up and choice for the UPotM. It's sad that Dwight was disappointed with his career. Looking at his filmography retrospectively, it's quite impressive. Key roles in at least four significant films. He had a great look, and I will always remember Dwight as Renfield, especially that superb shot of him (the last pic posted) and that laugh (which you quoted... twice!). It's wonderful to have you back, Becky, and this is another example of your talent and love of movies! Becky, I have not heard of the actor, Dwight Frye. I will look him up. Becky, you have paid a wonderful tribute to Dwight Frye. I think in the earlier films that character actors were more likely to be stereotyped. As Rick pointed out, his performance was then imitated and that truly is a wonderful compliment. I found it fascinating and sad to learn that someone chose to list "tool designer" on his death certificate. Thank you for another excellent writeup. Well done! Becky, what a great pick for underrated performer of the week. I'm afraid that many would-be great actors had their careers ruined by typecasting. Fortunately for Frye he created one of the most iconic sidekicks in film history with Renfield. Nice job! Becky, I enjoyed your post about Dwight Frye, though I was sad to hear that he died so young, and worse, he could have gotten bigger parts, but too late (with a wife and child to boot). Ah, Dwight, we hardly knew ye. Thanks for showing us there was more to Renfield, Big Sis, and Happy New Year 2014!